This stunning book with its clever use of serene shades of blue, tells the story of change and adjustment from a child’s view. It also reflects on the importance of community activity, and how colour and creating gardens can have a marked influence on people’s lives. Adam has moved from a suburban home to a high rise apartment in the city. The stories his parents tell him each night are what connect him to his old life. He draws and hangs pictures on the walls of the animals that were part of that life. Grey buildings and grey cement playgrounds are what he sees from his window. The children at play are the only colour to be seen. Shy and new, he creates animal images on the frosted glass above the inner staircases and sees snow for the first time. The grey becomes white. The apartment children build a snowman and Adam finds the courage to join them. He builds a snow elephant. The children join in. They unite to create a zoo of snow animals and new friendships are formed. Adam’s first day at school is the birth of a grand beginning. 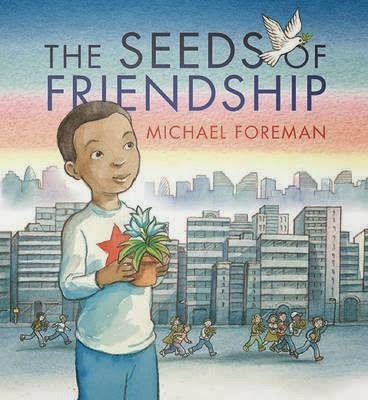 Seeds are sown - not only of friendship, but of the living kind. Gardens and green growth areas begin to expand across the grey, and colour fills the surroundings in a previously overcast world. Strong messages for children and adults are found in this layered story of change and adjustment, creation and friendship, and how ‘from little things, big things grow.’ Superbly illustrated by the author for the 5+ age group, the emotive artwork tells a story of its own. This book is a journey of discovery. With themes hidden everywhere, it’s a wonderful book to be shared by child and older person.